I have tried a few promotions over the years . . .
That's right! Refer someone to Pamm's House for daycare. If they come for an interview, you get a $5 gift certificate for daycare. If they sign-up and come for at least a week, you get a $10 certificate for daycare. Your certificates can be used right away or saved up to 6 months for a time when you may need it. My Mini-Flier is basically the same information that's on my business card, but a cheap version. I print out a sheet on different colored paper and cut them into 6 Mini-Fliers. March is "Spring Cleaning Month" at Pamm's House Here's a chance to clean out your closets, drawers, toy boxes, even the back porch AND get a few daycare dollars to boot! Here's how it works: Fill a bag or two or more with children's items you don't use anymore. Donate the bag(s) and/or other large children's toys or furniture to Pamm's House and you will receive a $5 gift certificate for each bag and/or large items donated, up to two certificates per family! HAPPY CLEANING!!! PammsHouse.com, 0-24 months, diapers/meals included (480) 788-PAMM. Note: This is very short to save money. Another money saver I found is to run my ad every-other day for 14 days (I get one month for the discount price of 2 weeks!). I order my cards from Vista Print. They're great! Instead of gift-buying for the other children in daycare, it is my policy that each family purchase a gift for the daycare instead. You can spend as little or as much as you'd like or you don't have to participate...These gifts will be opened by everyone at our Christmas party. I would prefer that your children do not know what you are buying. Wrap and label it "To Pamm's House" and have no "From" on it. Gently used items are okay. Here I list what we need/want. I print this out on 3 to a sheet on neon paper and stick it in the left side of the Parent Information Packet. It's simple, but does the job. Please bring a copy of your child's shot record. 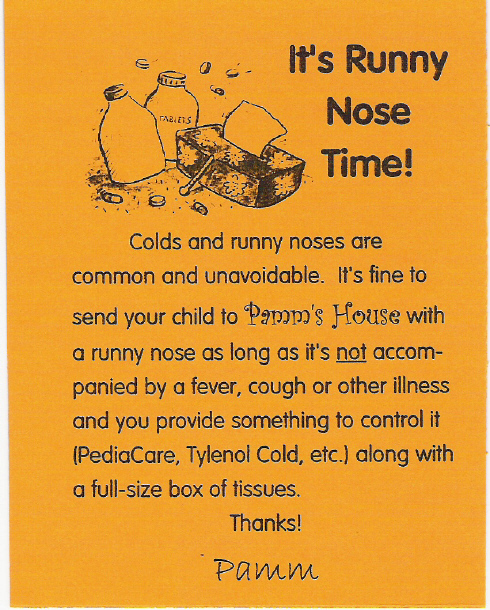 It seems everyone gets a runny nose all at once. I print these four to a page and keep them on hand to give to parents as needed. Now that they've taken the decongestants off the market, I'm not sure what to do? 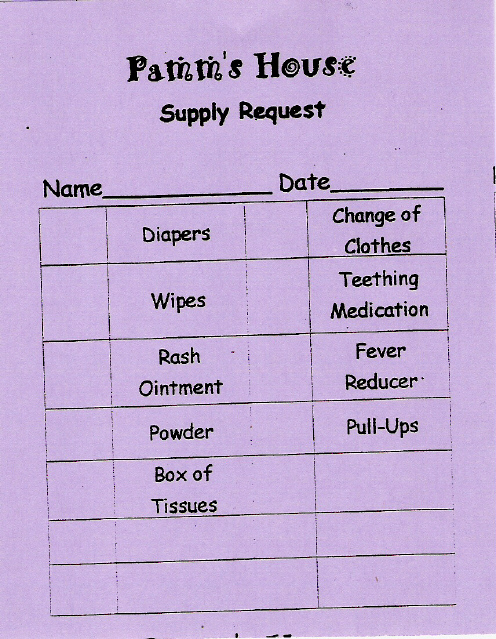 each Friday (or as needed) I check off what each child needs. Note: Now I text the parent reminders and put them on their Google Calendar.